Hrithik Roshan's 'Super 30' look is now a Wall Of Fame! 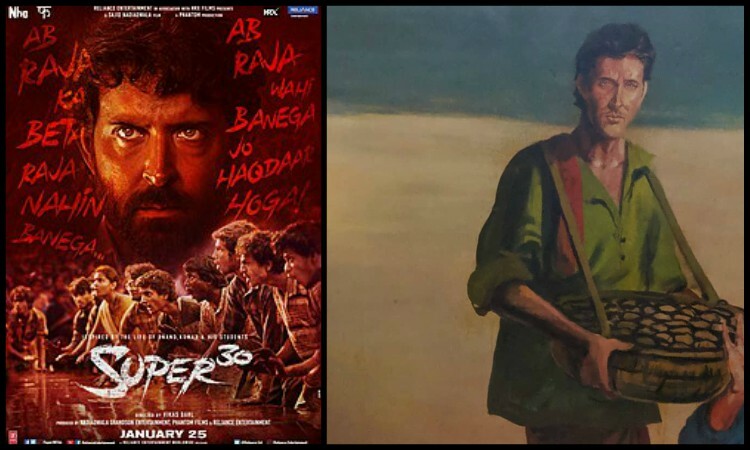 Superstar Hrithik Roshan's rugged look for his upcoming next Super 30 has gained immense popularity even before the release of the film, so much so that a restaurant has created a themed wall with his look. A restaurant named Mirch Masala in Kolkata, West Bengal has replicated Hrithik Roshan's Super 30 look in the form of a painting on the wall. The millennial Superstar has created humongous buzz ever since the first look of the film released. Earlier, multiple images from the sets were leaked generating curiosity to witness the actor in a rooted avatar for the first time. Hrithik Roshan has always treated his fans with style goals in his glamorous avatars. For this film, the actor slipped into a small town character sporting a rugged look with messy hair. Essaying the character of a mathematics teacher, Hrithik Roshan created an uproar on the internet as he released the first posters of the film. Not just the look of the actor but also the hard-hitting tag line on the poster 'Ab Raja ka beta raja Nahi banega, Raja wohi banega jo hakdaar hai' struck a chord with the audience. A testimony of the unfathomable fanbase of the Superstar is the themed restaurant with Hrithik Roshan's look. Ever since the announcement, there has been huge anticipation amongst the audience to witness the film. The handsome hunk who made one of the most remarkable debuts of all time in Bollywood is not only loved for his good looks but also his impeccable dancing skills. Touted as one of the sexiest men in the world, Hrithik Roshan enjoys a crazy fan following amongst girls as well as proves to be an inspiration for the guys across quarters.